A drop in temperatures may be a clear reminder that Summer and Fall are long gone, and that winter is slowly creeping in. 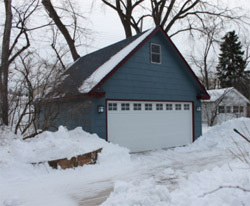 This is the best time to think about preparing your garage for this cold season. To prepare your garage for the winter, you need to conduct a thorough cleaning to get rid of all the dirt, debris, dead insects and creatures, leaves and the mulch that gets tracked in the garage during summer time. Clear everything from the walls and use a stiff push broom to sweep out the clogged dirt. Hit all the cobwebs from the walls and the ceilings using a shop vacuum. After cleaning the garage floor thoroughly, seal the concrete to assist in repelling moisture during the winter. It is easier to seal off any parts that could bring in the moisture, in the garage, if it is kept clean. Your garage doors should be weather stripped in order to keep off the winter moisture. If the garage is located under the bedroom or sitting room, weather stripping will help prevent the entry of cold air in around and through garage doors thus causing discomfort on the floors by cooling the hot air furnace ducts that are under the floor. You can achieve desirable weather-proofing by using convex rubber door stripping on the bottom of the door and weatherstripping the garage door around the perimeter of the door on a wooden frame. If you had installed weather-proofing the previous year, it is advisable to check if it needs repair or total replacement. No matter which method to heat your garage in the winter you choose, you don’t want that warmth to escape. Create the ventilation on the cavity of the garage in order to allow the moisture to get out through evaporation. Install a wall vent on two sides of your garage to allow the moisture to evaporation and leave the garage through the passive wall vents. Ventilation is also important to keep out the moisture created by the daily heating of the garage. Heat causes condensation, which turns into moisture, and if left unchecked, could have far-reaching health effects on the occupants of the house. Do a thorough assessment of your garage and locate all cracks and holes that bring in moisture and release the much needed warm air. Some of these areas include the cracks on the garage doors and the holes on your walls and doors. Other notorious areas include the area around electrical outlets and the dryer vent. Seal all areas that allow moisture into the garage with the caulking gun. Broken or cracked windowpanes should be replaced. Sealing off these areas will also pay dividends when it comes to keeping your garage cool in the summer. 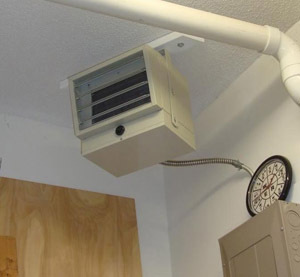 Install a garage heater to help warm your garage during the winter. Do not use the normal heater because it might cause fires especially if the garage has chemicals. Additionally, it cannot manage to provide the necessary heat for a large area such as your garage. Purchase an electric forced-air heater for this purpose. First off thanks for sharing these worth to follow tips for garage door. I must say all these 5 tips are very very helpful for many individuals. Thanks for sharing in a detailed manner.